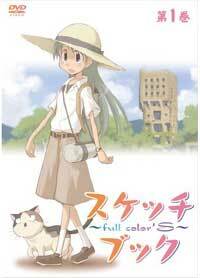 Also Recommended: Aria (in any of its incarnations), Yokohama Kaidashi Kikou. Notes: Based on the manga by Totan Kobako, serialized in Japan in the magazine Mag Garden. Sketchbook ～full color's～ was at one point on crunchyroll, but since has been taken down. Kajiwara Sora is an almost unnaturally introverted girl who joined the Art club in school purely for her love of drawing just about anything she encounters in a sketchbook she never leaves behind. Together with her classmates and clubmates -- a rather eccentric group in their own right -- she explores the surroundings, trying to capture as much of it on paper as she can. 2007 has been a very good year for me as an anime fan. Not only did the year see fit to grant me a second season AND an OAV for one of my favorite shows; Aria, but it also confirmed the third season of the same in the next year to go with the MANGA releases of the same. There's also been a few of anime titles based on visual novels from Key to get excited about, one of which its DVD sales in the US will start in 2008. It's basically been a good year for drama both light and heavy. As for Sketchbook ~full color's~, I went into it purely on the recommendation of some of my THEM buddies. It's the kind of show that stands silently on the sidelines, waiting to be noticed but not really flashing the contents around like its life depended on it. If I were to describe this show by way of comparisons with other shows, then I'd have to say it's a little bit like Azumanga Daioh with Yokohama Kaidashi Kikou's penchant for attention to detail towards its surroundings. Which is to say that it mostly communicates through its imagery. The main character of the show, Sora, is almost perpetually silent, letting her sketchbook do the talking instead. I'm not saying she never talks at all, but most of the lines in this show is supplied by her friends, occasionally supplemented with Sora's thoughts in fashion of monologues. As one who has lived most of his life in the countryside, I can certainly appreciate Sketchbook's observational nature. It's part of the reason I fell in love with the Yokohama Kaidashi Kikou manga, after all, and within this aspect of itself, Sketchbook finds most of its strength. The fact that the backgrounds are luscious and colorful, even if it struggles a little with depth and perspective, is certainly no small thing. As an example of what I'm talking about, the fourth episode stands out as one of the best. In it, Sora and one of her friends goes on a trip to a hill to draw before the rain sets in, and the attention to detail on the changing weather is spectacular, to say the least. It's a shame the characters in the show doesn't stand up to scrutiny quite as well, though. In fact, that's probably the show's only weakness. Sketchbook's cast isn't huge, and it's not like any of them are major annoyances, either. However, the fact still remains that you're more likely to remember a character for their eccentricies rather than any personal traits they might have. Even at 3/4's in the show, I have problems remembering anyone's name but Sora's, and if I were to describe anyone, I would be in a bit of a spot. Basically, the CATS in the show are as well developed characterwise as the girls. Speaking of the cats, it's interesting to note that all animal sounds are basically made by human beings in the sense that they're not as much making animal sounds as speaking it. I can't really explain it -- you just have to hear it to believe it. The really weird part is that it actually works too. Incidentally, while there are a lot of various animals and other creatures in the show, the cats are about as prominent as the girls, up to the point where they basically get an entire episode to themselves, which is the first episode where they actually get spoken lines. And, surprisingly yet again, it works too. I jokingly commented to myself that the cats in Sketchbook might very well end up stealing the show, as the girls -- Sora in particular -- seems to like them well enough. Of course, having seen Azumanga Daioh, I almost expected the cats to be evil incarnate, but thankfully, that wasn't the case. Their lives seems to go from begging for food around the neighborhood to contemplating whether their pride as free animals are worth sacrificing for accessibility to food and shelter and all the comforts that goes with it, the balance resting on Sora's habit of handing out food past its own expiration date. In the end, I can't really fault Sketchbook ~full color's~ for being what it is. If you can learn to love it despite its flaws, and I had no problems doing that, then you will find a show that simply is a pleasure to watch for anyone with a relatively high boredom threshold. It easily compensates for its somewhat limited characterisations by a quirky sense of humor and a quiet, reflective mindset on its own surroundings. As light entertainment go, it's certainly one of the better shows I've seen over the latest few years, and that definitely counts for something. Recommended Audience: With everyone and everything in this show being completely harmless, I can't really think of anything worth mentioning here. It's perfectly safe for anyone, even if the very youngest won't appreciate the sedate pace and reflective nature of the show. It doesn't really have any mature themes either, what with most of the cast being young girls.